What is Matcha? - Premium Japanese Green Tea. Matcha is the finest quality Green Tea from Japan. It is made from stone-ground and powdered green tea leaves and contains very high levels of antioxidants. Matcha literally means "Powdered Tea" and yet it’s a very special type of green tea grown only in Japan. It is a highly-prized, jewel-green powder that is whisked in a bowl with hot water to make a frothy beverage of the same name, or added to other recipes such as lattes, smoothies, savory sauces, or pastries. Preparation of matcha is the focus of the Japanese tea ceremony, and has a long association with Zen. Matcha is the only form of tea in which the whole leaf is consumed. 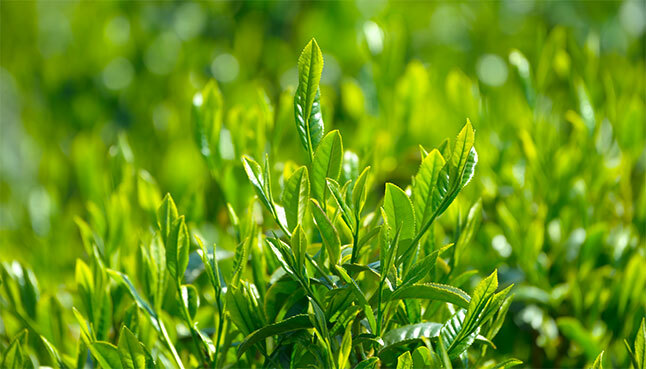 Because it is made only from top-quality young leaves that are grown, harvested, and prepared with great care, it has a much more beneficial health profile than other green teas. Its flavor and texture are unlike other teas; matcha is a beautiful and richly-flavored beverage. High levels of chlorophyll and amino acids give Matcha its unique, wonderful flavor. Unlike many teas which require sweeteners, Matcha has its own sweetness. Matcha made in the traditional Japanese style, whisked with water, is a full-bodied green tea. Like dark chocolate or red wine, Matcha has a rich flavor that you appreciate more over time. When added as an ingredient, matcha adds its characteristic lovely green color and a subtle flavor. About three weeks prior to tea harvest, the farmers cover the tea plants with shade cloth made of bamboo mats or tarp, gradually reducing the level of sunlight that gets to the plants. This increases the chlorophyll content and turns the leaves dark green. After the harvest, the tea leaves are steamed and air dried. Next, the leaves are sorted for grade, and then de-stemmed and de-veined. Now the leaves are called Tencha. Once the Tencha is ground into powder, it is called Matcha. Tea-grade Matcha is ground on a stone mill to achieve a fine powder texture, unlike industrial grade Matcha which is ground by machines. The stone grinding produces a specially shaped powder molecule which impacts the taste and mouth feel of the Matcha. All grades of "Gold Matcha" are stone ground. Why is Matcha tea more expensive than other green teas? Japanese teas are more expensive than teas from other countries. This is because Japan is a small nation, and it only exports a minute amount of its tea. That means that matcha production is limited. Covering the tea plants stresses them, so they cannot be harvested again for a longer period of time. Matcha is also labor intensive because many farmers pick the leaves completely by hand. After the harvest, the production is likewise an intensive process, including steaming, drying, de-stemming, sorting, grinding and packaging. Each stone grinder produces only about 40 grams of matcha in an hour. Matcha has always been a Japanese tea made by artisans in small amounts, so it has been an expensive drink for nearly 800 years. The pricing of Matcha in Japan is directly related to which leaves are used, where they were grown, and who grew them. The priciest Matcha has the greenest color and the softest texture. This means that only the youngest leaves were used, and that all the coarse fibers were removed. Yes. Matcha is a type of green tea, and it contains caffeine. For comparison, an average cup of coffee has 70-75 grams of caffeine, while matcha contains about 30 grams. Interestingly, Matcha is both a stimulant and a relaxant, so it can help you stay alert and focused on your work or play, and it can also help you calm yourself for meditation. Matcha can be prepared in many different ways. Please visit: How to use Matcha. Traditional utensils include a bamboo whisk, a tea sifter, a ceramic tea bowl, and a tea scoop. If you must choose only one, we recommend starting with a bamboo whisk, which froths the tea in the bowl and brings out its flavors. The history of Matcha utensils is as old as the Japanese Tea Ceremony itself. Matcha is sensitive to light, humidity, and oxygen, so it must be stored carefully and used quickly once its container has been opened. Store your Matcha in our air-tight, light-proof container. If not opened, you can store the Matcha in the refrigerator. Once opened, use the entire container within 1-2 months for maximum freshness and best taste.